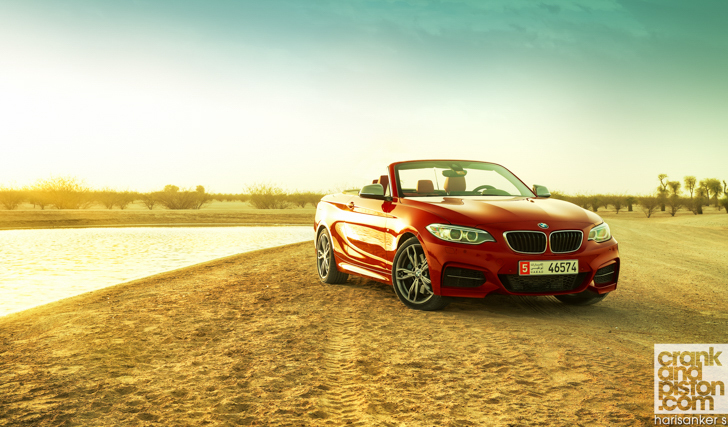 crankandpiston.com samples the sportiest BMW 2 Series yet. But is it just an ‘M’ car in name? 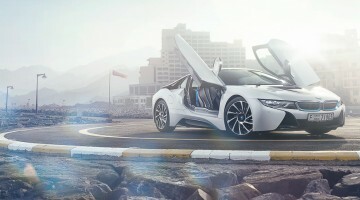 It was then, however, that BMW chose to give us a sneak peek into what the 1M could be. At the time it was a beta version and though we did not get to drive it, we at least got a passenger ride. At the time it was the grippiest car I had ever been in, and the acceleration merited supercar credentials. In the end, what finally came out was slightly tamer since, we all know, you can’t have a 1 Series lap faster than the flagship M3, which this thing could do and for $10K less no less. That’s like garlic to Dracula. Which brings us to its successor, the M235i. It’s the sportiest 2 Series to-date, packing as it does 326bhp under the bonnet and M-badges everywhere. And though it’s tempting to crack on about the power-to-weight ratio that 1600kg kerb weight brings, our test drive actually begins inside. The M235i (convertible in today’s case) features a comfortable seating arrangement with few rivals, a cabin layout that’s delightfully intuitive and on an instrument panel that, albeit slightly frugal, delivers all the info you need. The red leather interior might be slightly bling, but what can you expect from the M-Badge Department if not a little juvenile color-scheme? Does it have that M-car feel? 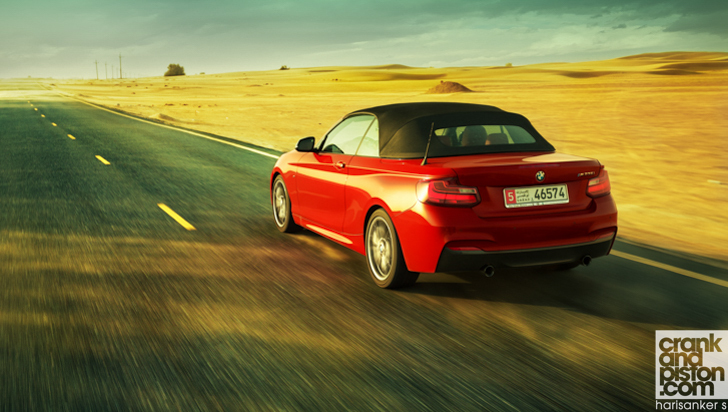 Well, it is on the road where every M-car must be judged, and the M235i doesn’t disappoint. At 4000rpm, the little butterfly valve opens and the second exhaust comes to life, to the annoyance of everyone around you. You shouldn’t worry though, as you are not around for long. And the acceleration is brutal: you could quite easily get dizzy from the thud your cranium receives from the headrest, just tenths of a second the pedal is assuredly pushed to the metal. 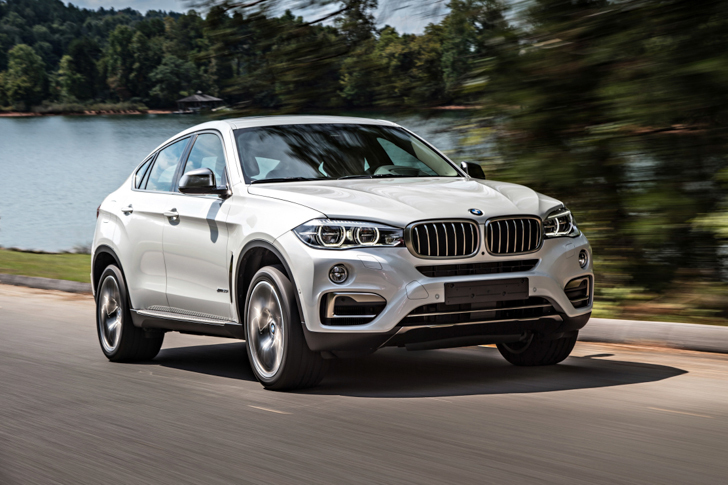 With just five seconds required to reach 100kph, this BMW is no slouch. This is understandable since under the bonnet lies the same engine block that powers the current M3. Detuned, yes, but the same straight-six, same 3-litres, the same bore and stroke, and similar twin turbos. Optimum punch is delivered at 6,000rpm, up to 332lb ft of torque available across the board. Oh, and did I mention the grip? It’s astonishing. Corners pass by in a blur, without hesitation and in millimetric precision. 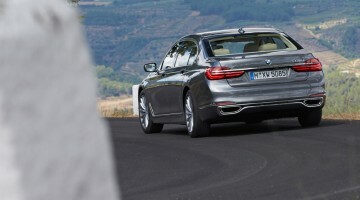 The steering firms up in sport mode and that extra weight only helps you get the car into the corner at the sweet spot. All this is helped by a superb suspension setup, a combination of springs that change the camber based on load, in the front, plus steel five-link at the rear. If this was not enough, the M235i also comes with an eight-speed automatic gearbox that, although not personally the gearbox I’d go for, makes sure the 245/35 R18 tyres can get you into the next corner ASAP. Brakes are not shy either. They are ‘only’ four pistons at the front and two at the back, but there is very little fatigue under even heavy usage. The whole construction though is betrayed by the chassis, which although very competent, is not as rigid as that offered on the roofed sibling. 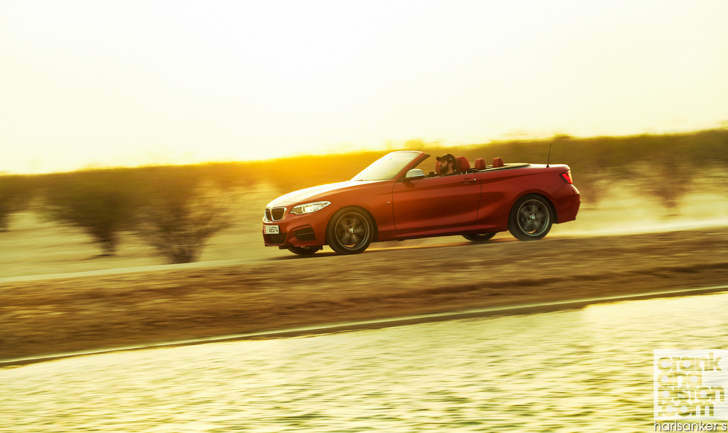 And hampered by 150kg extra, the M235i convertible exhibits a bit more uneven body roll than desired. Lest we forget we are talking about a convertible, and on that front, it is as good as convertibles go. We timed the transition at 22 seconds and the sound on the second exhaust is quite worth the nasty looks you get. However, no car is perfect, and there are a couple of things that let this model down. One is the rear seats, which offer less than adequate room for a human adult. Then there’s the centre console screen, which to me looks as much an afterthought as a Smurf hat, and the sound system, which is good and does a great work on noise canceling for Bluetooth conversation but misses a proper touchscreen. Being a convertible, the M235i also takes quite a bit of flexing to reach the safety-belt as it is so far back it pretty much lies on the car behind you. That being said, kudos to the new ConnectedDrive, which automatically upgrades the maps, apps and other configurations without assaulting your wallet. Round it up. What’s your overall thoughts? Well, let’s mull that over. A 3-litre turbo that offers 326bhp – and bear in mind that’s 109bhp per litre compared with the Porsche Cayman GTSs 100bhp per litre power-to-weight ratio – is nothing to scoff at. It’s comfortable, nimble, music to the ears, and though it may lack in practicality, it’s a model that lets us know BMW has not forgotten its intent of just five years ago, M3 anniversary event or otherwise. Granted the M235i is never going to threaten the M3. But I still want one.